Many people dislike white walls because they get dirty fast. However, if you paint them with gloss or semi-gloss paint they will be easy to wash (it's more difficult to the removed dirt from matt paint). Some types of wallpaper can also be cleaned with a wet cloth. And good paintable wallpaper can hold up to seven coats of paint. Another practical option for the white wall is a plaster with uneven texture as you can always apply a fresh layer to spoiled spot. lighter, more spacious, and required less frequent cleaning than when it was "natural". It should be mentioned that this does not apply to the white tiles in the kitchen or hallway as any dirt on it is visible and you may have to wash is almost daily. White furniture is a total miracle. The dust looks almost invisible on both hard items (tables and drawers) or soft ones (sofas and chairs). To avoid the need to call dry-cleaning to your home in case someone spills wine or tea on sofa buy upholstered furniture with removable covers & meticulously choose the fabric to make sure it's machine washable. Upholstery in white leather is a pick of luxury and requires gentle care. However, the leather of any other color also requires the same amount of care. Vacuum it once a month, wipe with a soft cloth with a special spray, do not place the battery or let the sun come in a direct contact with it. Also, avoid the use of stain removers and use detergent solution. And everything will be fine. It is much easier to remove the stain from white fabric (cover, curtains or tablecloths) than from any other color. White fabrics allow for a higher temperature in washing machine and can be easier bleached. However, be careful with the bleach. Even the one that does not contain chlorine is designed for soaking for 15-30 minutes. Soaking for much longer can deform fabric. If the stain appeared on the white rug immediately cover the spot with salt. The surface can then be treated with carpet cleaner and then rinsed it with warm water. White eliminates the pain of choosing colors. You don't need to wrestle with the combination of styles and materials. Everything is built into the ensemble. This is a godsend for inexperienced decorator or for someone not confident in his taste. White color never goes out of style, never becomes outdated or boring. This interior is will last very long time. It blends with all colors. If you create a white base it will be easy to lay down bright spots. 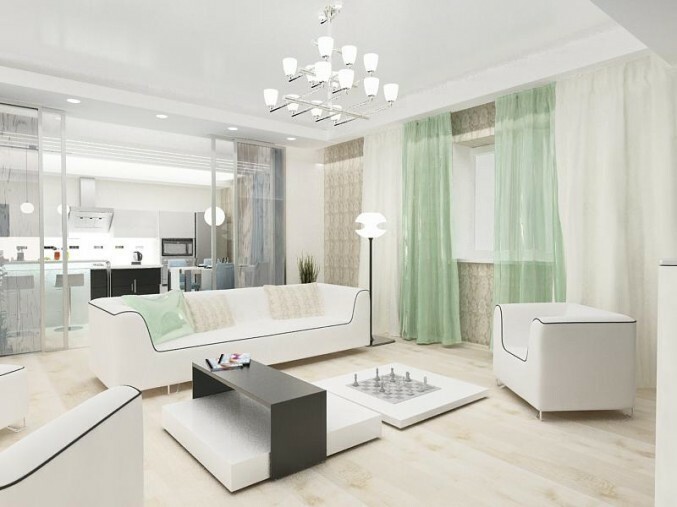 White color allows you to add new accents or exclude them from the interior as you wish. This color expands the space. 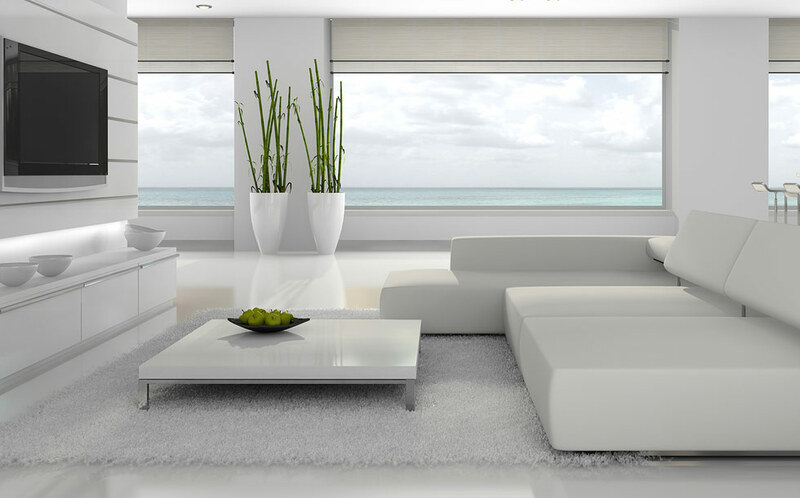 White room always looks bigger, bigger and lighter than a room of any other color. If you decided to decorate your house in white you can be certain that it will impress others and might look a bit show-offish. This is mainly due to the common belief that if the interior has a lot of white it automatically means that you have the money for the housekeeper and that at least once a week you have experts from the dry cleaners give you a visit. This can be understood since white interior (like white clothes) really does look elegant and expensive. This belief, however, forgets the advances in chemistry and removable covers for upholstered furniture which made this elite color mush more affordable. Today it requires no more attention than any other color, provided the correct materials and care.